Traditional Chinese medicine (TCM) is a broad range of medicine practices sharing common concepts which have been developed in China and are based on a tradition of more than 5,000 years, including various forms of acupuncture, herbal medicine, massage (Tuina), exercise (qi ong), and dietary therapy. Otherwise, the so-called Integrative Medicine, practised in China in the 1970s, uses TCM and Western Medicine simultaneously. According to Wang SH et al , (Guandong, China, 2007) electroacupuncture (main points : CV17 - CV5 - CV4 - CV12 - GB34) combined with Western medicine has a significant therapeutic effect on myasthenia gravis (MG) : one of the mechanisms would be to restrain specific immune reaction by regulating the level of IL-4. 60 patients with MG were randomly assigned to 2 groups, 30 patients in each group : • Experimental Group : Electroacupuncture AND Pyridogstimine (90-240 mg/day) AND Prednisone (30-60 mg/day). • Control Group : Pyridogstimine (240-480 mg/day) AND Prednisone (60-100 mg/day). Outcome measures : clinical therapeutic effects and Interleukin-4 levels before and after treatment. Voir en ligne : Brignol TN, Stéphan JM. The Chinese Traditional Medicine Treatment of Myasthenia Gravis : Can Acupuncture work ?. Paris [France] : Myasthenia 2013 Conference. Acupuncturist insert needles into specific points in various parts of the body, for stimulating the Meridians which connect the Internal Organs, and correspond to the Five Elements in the Universe. 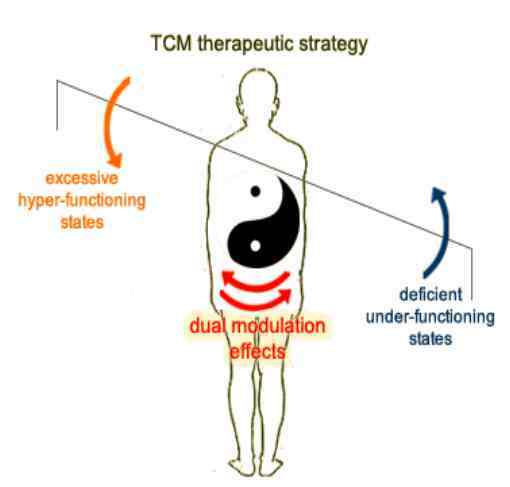 Yin and Yang harmony is the treatment goal of TCM. The overall therapeutic strategy is usually focused on holistic regulation and dual modulation : remove excesses and replenish deficiencies of Yin or Yang. The Chinese diagnosis is based on the differentiation of syndromes (Bianzheng) that will refine treatment. So myasthenia gravis (MG) may come in different clinical settings as a deficiency of the Spleen qi (pi) and Stomach qi (wei), a deficiency of yang Rate (pi) and Kidneys (shen), a deficiency of yin Liver (gan) and Kidneys or a deficiency of qi and xue.